In the films of Lord of the Rings, in the flashback to the battle where Isildur takes the ring from Sauron's hand, why was Sauron reaching towards Isildur, thus allowing him to cut off Sauron's finger? This is the scene, skip to 3:54 to see Sauron reach down towards Isildur. But why? Surely he knew that, even with a broken sword, Isildur would try to kill him. 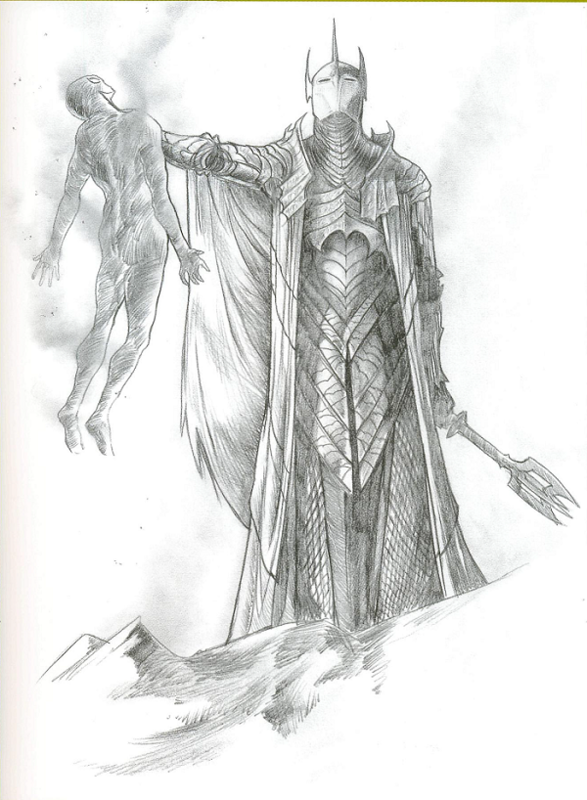 In-universe, Sauron was most likely reaching for Isildur to choke him and burn him to a cinder, as seen in this official concept-art picture from the "Art of the Fellowship of the Ring" (note the smoke rising from the body). Out-of-universe, we can be reasonably confident that the idea was simply to have Sauron be in a credible position to have his fingers chopped off. Note that in the earliest storyboards, Sauron overbalanced after striking at Isildur with his mace, however since the entire purpose of this scene (according to Peter Jackson in the commentary track) was to establish Sauron as a very credible enemy, having him then turn out to be a poor fighter only a few seconds later doesn't jibe with the extreme fighting prowess the audience has just witnessed. For the record, there's nothing in the script itself to indicate precisely why he was reaching. GALADRIEL (V.O.) (CONT'D) It was in this moment..when all hope had faded, that Isildur, son of the king, took up his father's sword. ISILDUR snatches up the BROKEN BLADE OF NARSIL..The BLADE severs SAURON'S FINGERS... AND THE ONE RING FLIES from his body. He was trying to burn and kill Isildur with his hand, just as he did with Gil-Galad. From Lord of the Rings: Fellowship of the Ring. It was hot when I first took it, hot as a glede, and my hand was scorched, so that I doubt if ever again I shall be free of the pain of it. The Ring misseth, maybe, the heat of Sauron's hand, which was black and yet burned like fire, and so Gil-galad was destroyed; and maybe were the gold made hot again, the writing would be refreshed. This was invented in the movie only and didn't happen in the book. According to the books, Gandalf said Sauron was "overthrown" and Isildur cut the ring from his finger after that. This was later clarified in a letter by Tolkien (I should say allegedly clarified) saying that Gil-galad and Elendil slew him. Repeatedly throughout the books Gandalf says that Sauron cannot be destroyed until the One Ring was destroyed. It's also said in Silmarillion that Sauron had the ability of creating himself to look either fair or foul. He lost this after the destruction of Numenor (which he was caught in) and could only appear foul. Clearly, the moviemakers had a lot of trouble with this aspect of Sauron. In the books in the Last Alliance battle, while Sauron isn't described all that much it's clear from context that he would have appeared as a half-human/troll/giant whatever and half shapeless spirit. Possibly even appearing as the Nazgul do in the movie - as a shapeless spirit in the real world but as actual humans in the "unseen" world. With such an appearance there wouldn't be an actual "finger" in the real world - at least as long as Sauron was completely operating. The conclusion I drew when reading the books was that Gil-galad's power was utterly spent in trying to defeat Sauron and during that last battle, for a moment Sauron was forced by Gil-galad into fully corporeal existence, and "knocked unconscious" and while lying there Isildur seized his chance and cut off the ring from Sauron's ONE finger - not knowing what it was or its power. (Gollumn says in the books that Sauron was missing only 1 finger from that hand, not all of them like the movie showed) When that happened, Sauron's corporeal body and spirit disappeared and Isildur was left holding the ring - which instantly began working its evil power on him, causing him not to destroy it. This would have been exceedingly difficult to create in a movie, particularly one that was aimed at a large audience who hadn't read the book, and be understood as what it was. So they elected the quick and dirty way out which was to show Sauron as a fully corporeal being thus allowing Isildur to appear heroic, slashing off all fingers in a desperate swipe, instead of as a sneak trying to rob an unconscious body lying defenseless on the ground, carefully cutting the ring off just 1 finger. It's also made clear in the books that the Ring has a will of its own. In the Last Alliance battle it's quite conceivable that after Sauron was overthrown by Gil-galad and Elendil that the Ring realized its only chance for survival was to voluntarily leave Sauron and capture another unsuspecting entity. Imagine if the Ring had managed to get itself taken by Gil-galad instead of Isildur - it would have utterly corrupted Gil-galad and a new Sauron - more powerful than the old - would have been created. Gandalf feared this would happen with Saruman in fact and said so in the books. We can guess that Tolkien was thinking that even during the Last Battle, the Valar were interfering in the Ring - by ensuring that Gil-galad was destroyed and thus saved from the Ring - and Isildur would take the ring. The failure of Man to fully complete a task is a strong theme in Tolkien's books. This is a Christian theme, by the way - Man's imperfection. As only God can be perfect, Man advances through failure - Eve's eating the apple, the continued failures of Job until God rescues him, etc. etc. But this kind of theme is not popular in He-Man Masters Of the Universe approaches to moviemaking, which is why Isildur is shown as a hero at the beginning of the film, instead of the flawed man that Tolkien wrote him to be in the books. Not the answer you're looking for? Browse other questions tagged tolkiens-legendarium the-lord-of-the-rings sauron the-fellowship-of-the-ring or ask your own question. Gil-galad: Did he die? How?